I am playing around with some royalty free clip I bought recently and came up with this pattern. Enjoy. I have been battling a bad cold the last week. I have fallen behind answering my email. I will get to all of them just as soon as I can.Thanks for understanding. 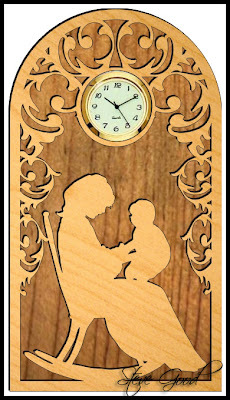 This mother and child pattern will be somewhat of a challenge to the newer scrollers out there. The front should be cut from 1/4" wood. The back should be at least 3/4" thick. Choose nice contrasting woods so the pattern stands out. 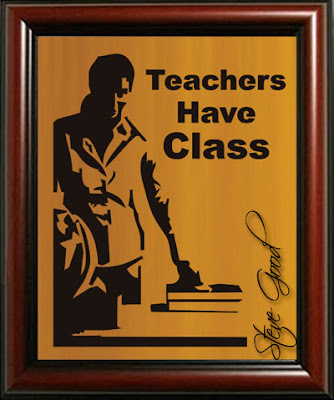 Use a 1 7/16" clock insert or a 1 7/16" picture frame. Mothers Day is celebrated around the world at different times of the year. In the United States we celebrate it on the second Sunday of May. 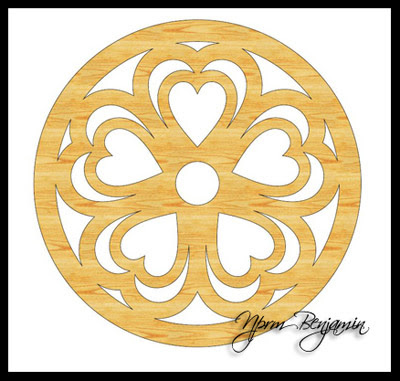 This is a pattern to help you honor the special mother in your life. Just a simple Welcome Plaque pattern. This mini clock pattern requires a 1 7/16" clock insert. Use a 1 3/8" forstner bit to drill the hole. I have been trying to get another Corel Draw video posted but I have been sick. My voice just won't cooperate right now. I have no idea why I made this pattern but I like it. 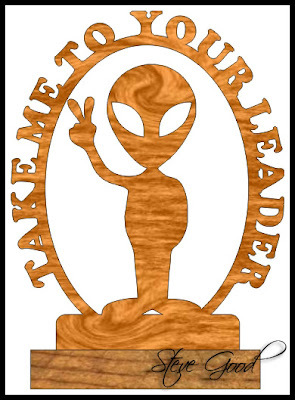 I guess if you live in Roswell New Mexico you might get some use out of it. Have fun. 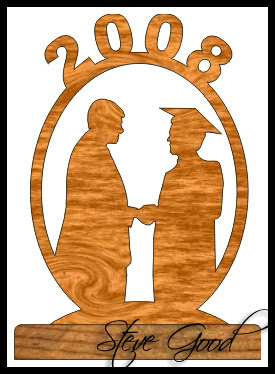 I had a request for graduation patterns from a reader. I thought some of the others here might like them also. The person that needed these has to cut several of these and wanted to keep then as simple as possible. I received this voice mail from Craig today. Thanks Craig I like your idea and plan to work on the video this week. 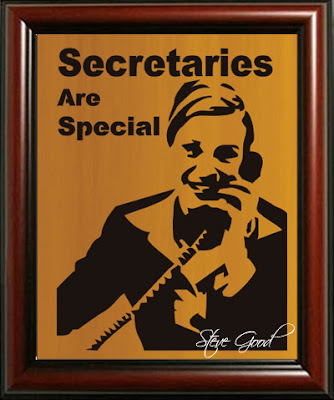 If you would like to send me a voice mail click the GrandCentral Call Me button on the blog. It's free and easy. If you are reading this from the email subscription you may not be able to listen to the audio. Your email client security setting may be disabling the audio. You can listen to the audio by visiting my blog at the Scrollsaw Workshop. After every video I make where I talk about how I finish my scroll saw projects I get emails about Lemon oil. I have always used lemon oil to finish my projects. 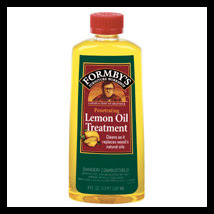 I buy Formby's Lemon Oil Treatment from my local grocery store. It's with the furniture polish and other cleaning products. I buy enough to half fill a plastic tub then I just dip the project. I then shake and wipe off the extra oil. This really brings out the natural color and grain of the wood. The lemon oil does not protect the wood so I usually apply a spray lacquer for gloss and protection. Dipping the project makes getting in all the fretwork easy and quick. 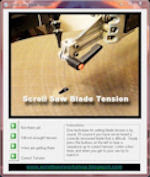 I have installed a new FREE feature on the Scrollsaw Workshop blog. The GrandCentral Call Me button. This is a new FREE Google service that allows you to call my voice mail FREE of charge. 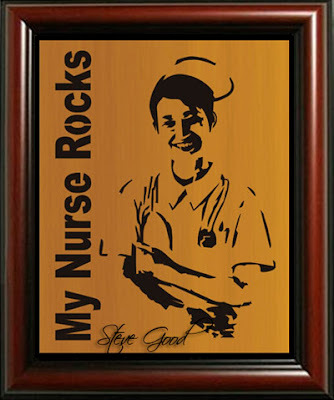 Visit my blog and look for the blue Call Me button. Click the button and enter your phone number. (Your number can remain confidential). Google will then call your phone and connect you to my voice mail FREE of charge. You can leave comments, questions and requests. I can then share your comment and my response on the blog. If you wish your comment to remain private just say so. I also like jokes. If you know any good PG rated jokes call them in and I'll post them. I am very excited about this new feature. I think it will add a unique interactive feature to the blog. So click the Call Me button and introduce yourself. 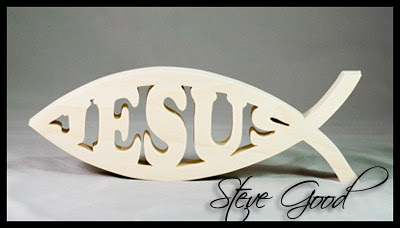 Early Christians identified themselves as followers of Jesus with the fish symbol or Ichthys. This pattern is 9" long and over 3" high. This would make a nice pattern to cut for your church fund raising events. I cut this one from poplar but any hard wood would look great. 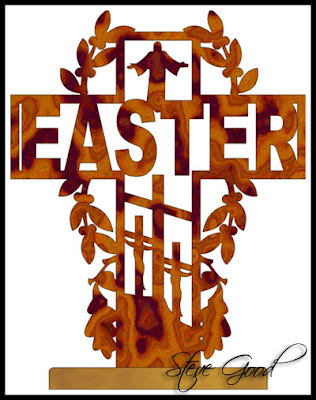 I thought I would start working on some Easter patterns. 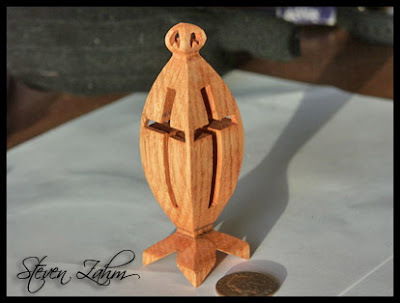 This cross stands about 8 1/2" tall and 7" wide. It stands on a small oval base. You could remove the base and hang it on the wall if you choose. 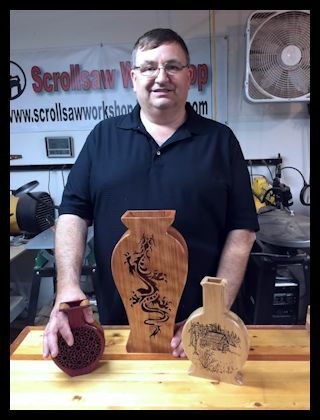 I'm looking for a business that would like to sponsor a monthly give away here at the Scrollsaw Workshop. If you are or know of someone who would like to donate a product or gift certificate please contact me. Nothing to add here. Just watch and enjoy. Talk about using every last scrap of wood. This scroller cuts miniature patterns freestyle. I have no idea what he is saying but it's a fun video to watch. One tip you can take away from this video is the auxiliary table top he is using. If you are cutting small pieces you can drill a small hole in a sheet of ply and attach the ply to your table top. 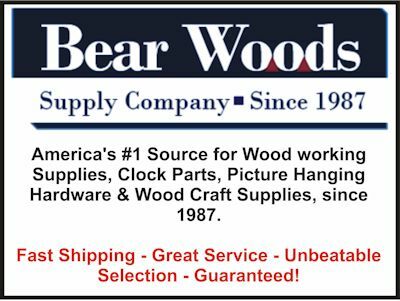 Prevents the pieces from falling into your saw. This video continues the series of Corel Draw Basics. I take you through the positioning tools of Draw. 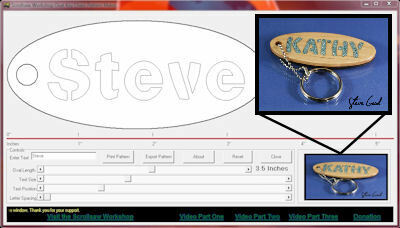 In the next Corel Draw video I think we will use these basic tools I have been talking and design a scroll saw pattern. 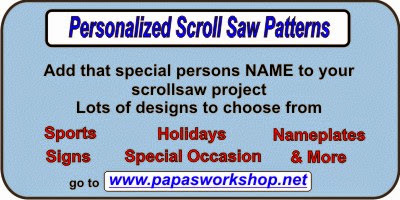 Hopefully that will begin to make things click on just how easy it is to use Draw to design patterns for your scroll saw. 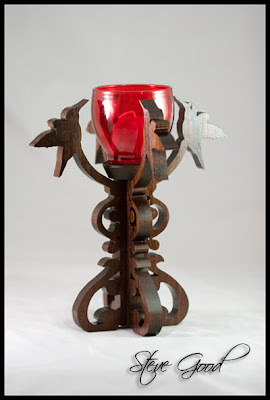 I have received a few emails about the candle stands I have uploaded. They look much more complicated than they actually are. I thought I would upload another one and do a video to show just how simple they are to make. Please excuse all the times I misspeak in this video. My brain was not in sync with my mouth. 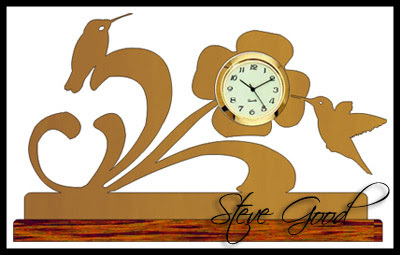 Here is a simple little pattern for a 1 7/16" mini clock insert. Use a 1 3/8" forstner bit to cut the hole for the clock. 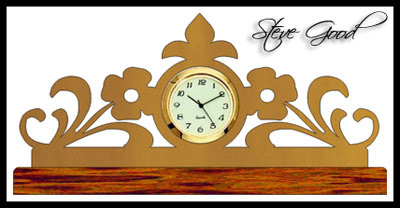 The clock can be cut from 1/2" to 3/4" wood. If you are a beginning pattern maker these mini clocks are easy projects to get started. The designs are limited only to your imagination. This is a quick pattern I designed for a reader who collects cardinals. I thought a few others might like to cut it also. The tail feather are going to be a little fragile so cut with care. I would cut the top from 1/2" wood and the base from a 3/4" contrasting wood. Add a decorative profile to the base if you have a router. I have not posted many patterns lately. I'll try to upload a few in the next week to try and catch up. I cut this pattern from 1/2" walnut. The candle cup can be up to about 2 3/4" in diameter. 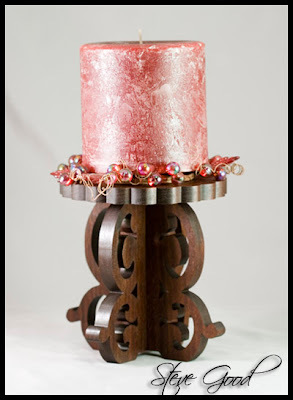 When you cut the small round platform that the candle sits on it should be sanded to a taper. That's difficult to see in the picture but you will see what I'm talking about when you cut it. The taper gives it a more delicate look. 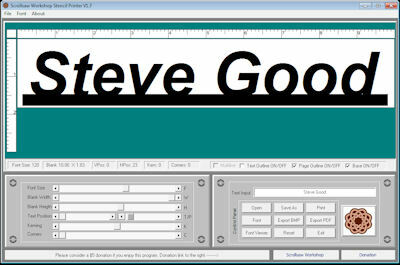 This tutorial continues the series on Corel Draw basics. I talk about the line drawing tools. Of these tools I use the pen tool the most in creating patterns but the other tool have their place. 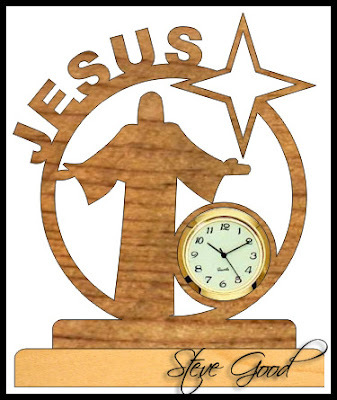 Here is a 3d ornament pattern sent to me from Steven Zahm. Steven wanted to share this with everyone. Thanks Steven this is a nice looking pattern. I'm sure many of the readers here will enjoy cutting this one. The ornament is a little over 4" tall and 1 1/4" wide. If you need help cutting 3d patterns look back through the archives and you will find a video tutorial on the subject. 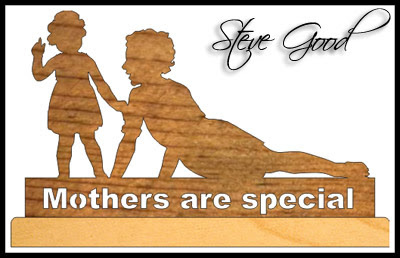 Steve: Thank you for all the beautifull things you make for us, I enjoy a lot your projects and Corel tutorials. 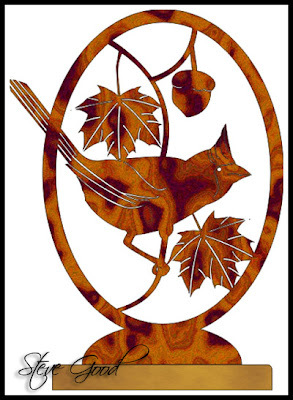 I receive every week free images from Dover Publications and many can be used with the scroll saw, others can be modiffied with Corel, they also sell the books. This may be helpful to many. Thank you for the tip Lucy. I also spent some time on your website. You are a truly gifted artist. 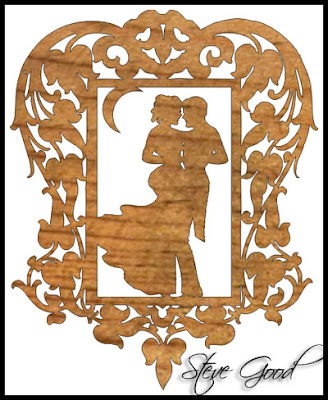 I encourage everyone to take a little time and visit Lucy's website. She creates some amazing sculpture. Make sure you click on the images in her gallery to open up her portfolio and see all the great work. Norm Benjamin has allowed me to share another of his patterns with my readers. Norm continues to master Corel Draw. As he learns new tools and techniques his patterns get better. 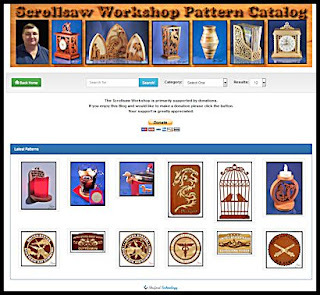 Would you like to design patterns also? Download the trial version of Corel Draw and give it a shot. In this video I continue to talk about the basic features of Corel Draw. Tonight I discuss the rectangle, ellipse and polygon tools. For those of you that are parents of students, students or teachers here is a web site that has great academic discounts for Corel Draw. They have Corel Draw X4 for $94.95. 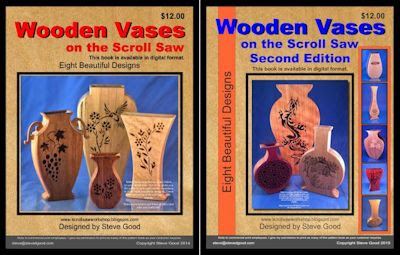 If you want to get started creating scroll saw patterns this might be a good place to check out. 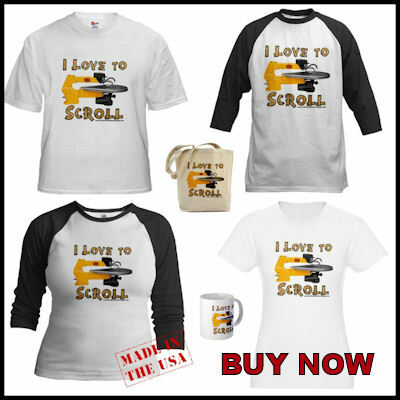 I have not purchased from them but I plan to in the near future. I'll let you know how it goes. One last occupation pattern for today. More to come later. Here is another pattern in the occupation series. Hope you all like these patterns. Let me know. This is the first in a series of occupation patterns. I plan design several of these patterns. If you have an occupation you would like to see a pattern for drop me an email. I think these might be good sellers at shows and in craft shops. I would be curious to know if you have any luck selling these. I have been reading that Baltic birch ply will be more expensive this year because of shortages. If you do a lot of these portrait style patterns you might want to look around for supplies early. Maybe you can find some at last years prices and beat the increase. 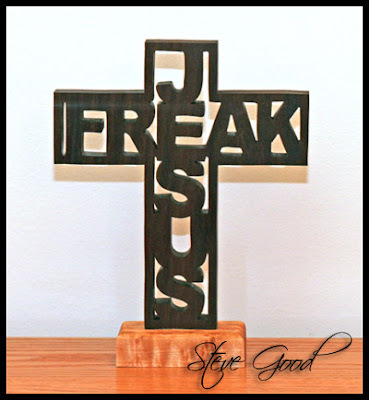 The term Jesus freak has been adopted by many Christian youth as a positive term to show others they are not ashamed of their beliefs. The term originally grew out of the 60's hippie movement and has morphed over the years form an insult to a badge of honor. I cut this cross from walnut and maple. The cross is 9" tall and 7"wide. My wife wanted a mini clock with the hummingbirds from the collapsible basket pattern I posted last week. This mini clock uses the 1 7/16" mini clock insert. Use a 1 3/8 forstner bit to cut the hole. Corel Draw X3 Basics. The Pick Tool. Here is the second video in the series of Corel Draw Basics. This video covers the difference between vector and bitmap graphics and then discusses the pick tool.